In the September issue of the JCI, Liao et al. demonstrate a unique role for Kruppel-like factor 4 (KLF4) in mitochondrial regulation. Cardiac-specific deletion of Klf4 in adult mice induced cardiomyopathy in response to pressure overload, with marked alterations in mitochondrial function, and embryonic cardiac-specific Klf4 deletion resulted in postnatal mortality with impaired mitochondrial biogenesis and function. The authors demonstrate that KLF4 interacts and cooperates with the ERR/PGC-1 pathway in mitochondrial regulation and that KLF4 transcriptionally regulates autophagy genes in cardiomyocytes. 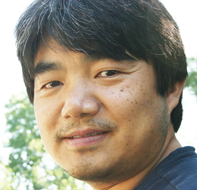 This month we talked with first author Xudong Liao about his view of this work, his personal reflections on training in two different countries, and his advice on how to succeed in biomedical research. I am originally from China, which is where I grew up and trained. I went to Peking University, where I majored in biology. After my undergraduate education, I was drawn to medicine and the biomedical sciences and decided to pursue a PhD at the Peking Union Medical College. There I worked with Dr. Lan-Ying Chen studying cardiac hypertrophy and later with Dr. Quan Chen at the Chinese Academy of Sciences studying cardiomyocyte apoptosis. I finished my PhD in 2003 and made the decision to come to the U.S. for postdoctoral training after I met Dr. George Stark in China. I joined Dr. Stark’s lab at the Cleveland Clinic for my first postdoc on molecular genetics and then completed a second postdoc on molecular cardiology in Dr. Qingyu Wu’s lab. In 2008, I joined Dr. Mukesh Jain’s lab as a junior faculty member and have been in his lab since then. What advice do you have for non-U.S. graduates who would like to pursue postdoctoral training in the U.S.? I would first say that anybody who is considering coming to the U.S. should have a good understanding of the U.S. educational system. There should be a firm understanding of how the NIH functions, as well as the career pathways and funding opportunities at the institution they are considering. The second piece of advice is to find a good mentor and choose a research field they find interesting. Lastly, one needs to be prepared for how the research world works here in the U.S., especially the nonscientific part, such as promotion and tenure. What has been the most challenging aspect training in two countries? The most difficult part was the original culture shock and the language barrier. You need to learn good communication skills. This is incredibly important, as both writing and speaking are essential to success in science. It is through writing and speaking that one can communicate the passion for and the importance of the research one is doing. What are the factors that you think contributed the most to the success of your personal career, as well as the success of doing this research that you’re publishing in the JCI? I owe my success to all the mentors who have trained me over the years. I knew very little about the KLF family until I joined Dr. Jain’s laboratory, clearly a pioneer in this field. Thus, over the years, it has been with the collaboration with my colleagues and Dr. Jain’s guidance that I became more knowledgeable about this field. The KLF family is complicated, and I feel extremely lucky to have uncovered a role for KLF4 in the field of metabolism and mitochondrial biology, but this was only possible with the help of my mentors, colleagues, and fellow collaborators. What has been the most challenging aspect of this work? I have been working on this project for six years. The most challenging aspect was to define the role of KLF4 in mitochondrial function. Mitochondrial dysfunction in heart failure is a well-known problem. Mitochondria are crucial to the heart, but what was not clear was whether mitochondrial dysfunction is a result of the heart failure or a cause of the heart failure. Thus, I had to define the role of KLF4 in mitochondrial biology directly, and to do that I needed to move outside the mouse model. We were able to demonstrate this in in vitro work and show that KLF4 has a direct role in mitochondrial function and cell autophagy. This was challenging, but very importantly demonstrated that KLF4 directly influences mitochondrial function in cardiomyocytes. Mitochondria are the basic power machine of cells. Discovering the role for KLF4 in the heart allows us to take a broader approach and look at the role of KLF4 in mitochondrial function in many other cellular systems and organs. For instance, the skeletal muscle and the vascular system will be important to further investigate the role of KLF4 in mitochondrial dysfunction. KLF4 has also been shown to be important in cancer and stem cell biology. Investigation of the role of KLF4 and mitochondrial function in tumor biology and how this relates to tumor metabolism will be an important area of future research. For stem cell biology, investigation of the role of KLF4 in the autophagy pathway and the role of the metabolism switch in the stem cell are important future areas of research. I have a family with young children, and my time outside the lab is filled with fun activities with them. My biggest joy has been to see my children grow up over the years. Our oldest is almost 10 years old now! They are a very important part of my life. Here I want to thank my wife for these lovely children. I like to spend the rest of my time reading literature and history. I also enjoy watching the documentaries on the History channel, Discovery channel, etc., and sci-fi films. Now with LeBron James in town, it is fun to watch games too. Is there any advice you have for young researchers? Biomedical research is extremely hard and we are trying to understand an incredibly complicated system. During my research years, I have learned that your hypothesis may not always be right. However, you are trying to find an explanation for the facts that you have directly observed. Never argue with those facts you have observed, because a fact is fact. If it does not agree with your hypothesis, it is your hypothesis that needs to be revised. With hard work, patience, and a supportive environment, one can have a successful and productive career in scientific research. Xudong Liao, PhD, is currently an Assistant Professor at the Case Cardiovascular Research Institute, Department of Medicine, Case Western Reserve University School of Medicine. He received his bachelor degree in physiology and biophysics at Peking University and PhD in biochemistry and molecular biology at the Chinese Academy of Medical Sciences and Peking Union Medical College. His research expertise is in heart failure, inflammation, metabolism, and mitochondrial biology. Brittany Weber, MD, PhD, is a senior resident in the internal medicine residency program at Brigham and Women’s Hospital and a clinical fellow in medicine at Harvard Medical School. She plans to pursue a cardiovascular disease fellowship and her scientific research interests include roles for the immune system in heart failure pathogenesis. Dr. Weber is a graduate of the Medical Scientist Training Program (MSTP) at the Perelman School of Medicine at the University of Pennsylvania, where she received a MD and PhD in immunology. Citation Information: J Clin Invest. 2015;125(9):3461-3476. https://doi.org/10.1172/JCI79964. Mitochondrial homeostasis is critical for tissue health, and mitochondrial dysfunction contributes to numerous diseases, including heart failure. Here, we have shown that the transcription factor Kruppel-like factor 4 (KLF4) governs mitochondrial biogenesis, metabolic function, dynamics, and autophagic clearance. Adult mice with cardiac-specific Klf4 deficiency developed cardiac dysfunction with aging or in response to pressure overload that was characterized by reduced myocardial ATP levels, elevated ROS, and marked alterations in mitochondrial shape, size, ultrastructure, and alignment. Evaluation of mitochondria isolated from KLF4-deficient hearts revealed a reduced respiration rate that is likely due to defects in electron transport chain complex I. Further, cardiac-specific, embryonic Klf4 deletion resulted in postnatal premature mortality, impaired mitochondrial biogenesis, and altered mitochondrial maturation. We determined that KLF4 binds to, cooperates with, and is requisite for optimal function of the estrogen-related receptor/PPARγ coactivator 1 (ERR/PGC-1) transcriptional regulatory module on metabolic and mitochondrial targets. Finally, we found that KLF4 regulates autophagy flux through transcriptional regulation of a broad array of autophagy genes in cardiomyocytes. Collectively, these findings identify KLF4 as a nodal transcriptional regulator of mitochondrial homeostasis.